On a weekly basis I field a lot of questions about my evolution as a distance runner. Someone who in early 2006 was walking for 30 minutes over their lunch hour who now has their sights set on a sub 3 hour and 10 minute marathon. Hard to believe sometimes just how much things have changed for me since those very first tentative strides. I get asked about shoes a lot. Just happened to me Wednesday afternoon when I was in the dentist chair having my teeth cleaned. I still don’t know how anyone can do that for a living. I get asked about training plans, how to avoid injury, even injuries themselves. Sometimes the questions are more philosophical. Whether or not I enjoy running or if it is something I do just to stay in shape. Other times the questions are more practical. How long does it take you to run that far? How many miles do you run every week? But the question that I have never been asked that seems so logical to me is this one. I’m a morning runner. Always will be. I prefer to get out there before daybreak and get my run in long before the sun comes up this time of the year. Most mornings at 7:00 a.m. I have been awake for about two hours and have been running for all but 20 or 30 of those minutes. The rest of the time spent on brushing my teeth, dressing, stretching and a quick post-run shower. From spring through fall I will leave the house in the dark and come back just after sunrise. I only run “in the dark” for 3 or 4 miles. The rest of the time there is a fair amount of ambient light as the sun rises. Sometimes when the Texas sky is clear and there is a full moon high overhead it is like God left the light on just for me. Those are truly glorious mornings. But from November through the late winter months it’s dark. Really dark. If I wasn’t running on the same trail system every morning it would be really tough out there. As it is I know where just about all of the ruts and rough patches are, where the loose stone is and what part of the trail is the smoothest. I am on auto-pilot a lot of mornings gradually working the left side and the right side of the trail by memory to find the best footing. But after storms when the terrain has been disrupted or when a stray stone or limb has gotten disturbed I’ve tripped a fair number of times and certainly turned an ankle or two. The solution was an obvious one. Buy a headlamp. But as much as I like running gear and gadgets I had been reluctant to put on a headlamp. I could see well enough I thought. Who needs some added weight bouncing around on your head. Just wait for your eyes to adjust and you’ll be fine. Well along came the Ragnar Del Sol Relay Race that I will be participating in next month the week after the Austin Marathon. Ragnar is an overnight 12-person 202 mile relay race through the Arizona Desert from Wickenburg to Tempe. I am assigned three legs of the course and the 2nd leg for me, number 13 for our team is going to fall in the middle of the night. So it was inevitable. Time for me to get a headlamp. I did all of the usual research. Hit the runner forums, checked out Runners World, Daily Mile, asked a few friends, googled and read reviews. I was looking for a couple of key things in a headlamp. 1. I want it to be light. 2. I want it to be bright. 3. I want it to stay in place. 4. I want it to have its own rechargeable battery. 5. I wanted to be able to control the brightness. 6. I wanted to be able to control the lights trajectory. 7. I wanted it to last a long time on a charge. Pretty much I wanted it all. The other requirement that did not make the list above, but is something that I have learned to look for in most running purchases. I only wanted to do this one time. I did not want my new hobby to become buying a series of headlamps that I didn’t like to save $5 here or $10 there. In the end I typically end up spending more money and have a “collection” of equipment. I mean how many headlamps does a guy need? 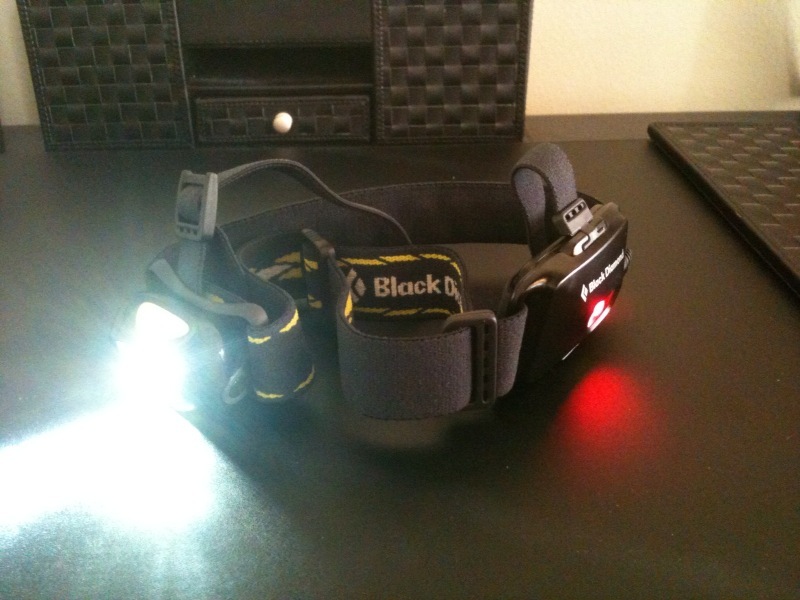 The winner of my search was the Black Diamond Sprinter Headlamp. The Black Diamond met all of the requirements above and even threw in a few other cool features as a bonus. The Sprinter wields a very bright LED bulb. Clicking the button on the front of the headlamp turns it on. If you hold down the button the headlamp will dim down to the level of brightness you like the best. By releasing the button, it will stay at that level of brightness. As an added feature if you click the button twice, the headlamp will continuously flash. It also features a “tiltable housing” that can be easily adjusted after you put the headlamp on. So if I am wearing the headlamp directly on my head or over a ball cap, I can adjust the beam of light so it hits the trail in front of me exactly where I want it. Pretty nice feature. The battery is a rechargeable lithium polymer battery. It is built into the back of the headlamp strap. The headlamp snaps easily into the charging unit without taking anything apart or adjusting any straps. On a full charge the maximum battery life is 64 hours. The total weight of the headlamp is just 3.5 ounces and as an added bonus, the rear battery area has a flashing red light that can be either turned on or off with a push of a button. After taking the headlamp out of the package I had it on my head, adjusted and fired up in less than 3 minutes. Really an easy product to use and the lamp is extremely comfortable. Wednesday morning’s 11 mile training run was the fifth time I have taken the headlamp out onto the trail and I am beginning to wonder how I ever ran without it. No longer do I find myself straining to see the ground 10 feet ahead of me, wondering where the next obstacle is I am going to have to dodge. The light is very stable, does not bounce violently – in fact it rocks in a somewhat soothing motion with my stride illuminating the trail ahead of me. The biggest adjustment has been seeing the increase in wildlife that I suspect has always been looking at me pass by every morning from the safety and secrecy of the brush lining the trail. What was once darkness is now illuminated with bright eyes shining back at me. On Saturday morning I caught close to a dozen deer running across a field to my left that I never would have seen without the Black Diamond Sprinter on my head. The true test will come in the wee hours of the morning, Saturday February 26th, when it is me alone, cruising through the Arizona desert at night wondering, “Where’s the damn van?”. (Our team name at Ragnar and what I will be thinking more than once I’m sure). 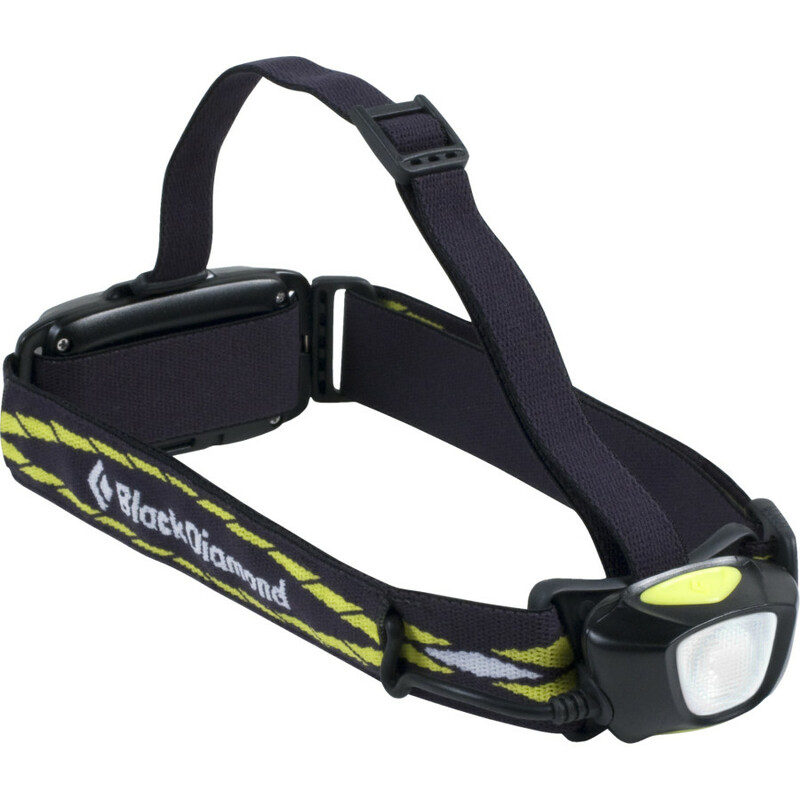 So if you are in the market for a headlamp – I have to say I have been very impressed with the Black Diamond Sprinter. It’s comfortable, light and bright. Retail price somewhere around $65 on-line. As a reminder since it has been awhile since my last product review here at Run for Dom – these are simply my honest opinions about a product after I have had time to try it myself and see how it holds up. I am in no way compensated for my time or my opinion. Nice review Joe. About how far/wide of a range does the lamp illuminate in your experience? Hi Adam! Thank you so much for the visit and the message – you are looking good out there right now! The lamp has a setting to dim the light depending on your need and preference. It also has a tilt feature which allows you to point the lens further out or closer to your feet which is nice on the trails. If I had to estimate, on the high setting, it casts light 25 feet ahead and about 10 feet on either side of me. I feel like I have plenty of time to adjust to where my stride will fall in 6 or 7 paces. Hope that helps! Yes definitely. Thanks for the feedback. I am currently heading out in the 5 o clock hour with nothing more than an energizer head light, which probably casts about 6-7 feet in front of me, and in the really dark sections, it’s questionable as to whether or not it is enough light. Gonna take a look at this piece. Thanks again!